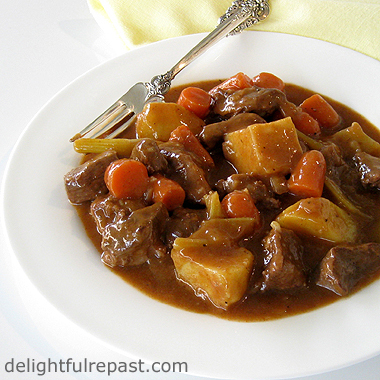 Beef stew, the old-fashioned kind, is the perfect wintertime comfort food meal. Well-browned organic grass-fed beef gives it a depth of flavor that requires nothing more than the simplest ingredients to make a soul-satisfying stew. Rod at Rocky Mountain Organic Meats kindly sent* me a chuck roast that I decided to make into a stew. I had thought I might make Boeuf Bourguignon, and I always cut up the meat for that myself. If I had known I was going to be more in the mood for an old-fashioned stew, I might have used their precut stew meat instead. The beef was, as my husband said, so much better than conventional (supermarket) beef, very tender and flavorful. *And, in case you are new to Delightful Repast, I always mention when a product was given to me and I always give my true and honest opinion of any products I mention in my blog. I turn down far more product offers than I accept, usually because the product is not something I would ever use or recommend. The beef and lamb from Rocky Mountain Organic Meats are 100% grass-fed, grass-finished and certified organic. No hormones. No antibiotics. No grain. No GMO feed. No irradiation. No feedlots where deadly antibiotic-resistant bacteria thrive. Rod is dedicated to environmentally friendly agriculture practices, healthy land stewardship and--most important to me--the ethical treatment of animals. The animals are allowed to roam free and are treated humanely. Notice the photo is of a plate of stew. All my life I had a bowl of stew. But my husband, being neither English nor Southern, is not an "it's all about the gravy" kind of guy and prefers to have stew on a plate. Where do you stand on this important issue: bowl or plate?! Update 01/17/19: Slow Cooker Beef Stew, Pressure Cooker/Instant Pot Beef Stew. 1 In 5.5-quart Dutch oven (I use a Le Creuset 5.5-quart enameled cast-iron French oven), heat 1 tablespoon extra virgin olive oil over medium-high heat. You will brown the beef in 4 batches. 2 Dry the beef cubes a batch at a time with paper towels, add to hot oil and brown very well in single layer, sprinkling with 1/8 teaspoon each salt and pepper and 1 teaspoon Worcestershire sauce. Transfer browned beef to large bowl. Repeat three times. 3 Adding another teaspoon of olive oil if needed, sauté chopped onion until soft. Add to browned beef in bowl. 4 Over medium heat, heat butter and whisk in flour, cooking about 5 minutes or until lightly browned. Whisk in broth. Simmer, stirring frequently, until thickened. Stir in tomato paste. Add browned beef and onions to Dutch oven. 5 Add wine, water, ketchup (I know, I know, but I promise it adds a certain something and doesn't taste at all ketchupy), marjoram, crushed red pepper flakes and 1/2 teaspoon each salt and pepper to Dutch oven. Bring to boil; reduce heat, cover and simmer 45 minutes. Note: And, since you have a few minutes before you need to prepare the carrots and celery, you can read my stew-related story, Life Lesson in a Flame-Colored Pot. 6 Add carrots and celery. Bring to boil; reduce heat, cover and simmer 30 minutes. 7 Add the potatoes and 1/2 teaspoon salt. Bring to boil; reduce heat, cover and simmer 45 minutes. During last 10 minutes, thicken with a mixture of 1 tablespoon flour and 1/4 cup water; taste and adjust seasoning. Well, maybe minus the carrots. Hate cooked carrots. Soggy pre-masticated squash in a stick. And forget the potatoes. Same texture. I could eat a ream of 20-lb bond LaserJet paper and get the same sensation. Oh yeah, gravy. Who needs it? Watered down beef blood with flour thrown in to give it the texture and look of mud. I won't tell, Jenn! I know what you're talking about. I don't think there's anything worse than BAD beef stew. My elementary school had THE worst ever! Well, Sully, that was certainly a pretty (and appetizing) picture you just painted! LOL But I assure you, those carrots and potatoes are not "soggy"! You must have had some really bad beef stew early in life. Hey, did we go to the same elementary school?! Now if you'd just mixed in some coffee blast icecream... I'm sure Sully would have been in seventh heaven lol. To me, your stew looks and sounds delicious. Just the thing after a long days skiing! Thanks, Grant! Nothing too exotic or strange, right? Oh man this looks truly hearty. I've never made a beef stew the American way...will have to give this recipe a whirl. May the peace, joy and lots more good eats of the season be yours today and always. Happy 2012! Tia, thank you! And a Happy 2012 to you as well! I hope you will try this soon and like it as much as we do. And I must try one of your Caribbean recipes! Thanks, Charles! Oh yeah, gotta have plenty of good homemade bread to mop up the sauce! I'll tell my husband he's got one vote for stew on a plate! Oh man, lately, I've been craving this traditional beef stew... I think I need to make some sooner than later. Definitely sooner, Sook! There's nothing like it on a cold winter's day! Looks delicious, Jean! A true wintertime staple here in NW Wisconsin. May you have a wonderful 2012. I look forward to more great food photos and recipes. :-) Thank you for reading Cranberry Morning. Thanks, Judy! Hope you have a wonderful 2012 too! Your beef stew is perfect for the cold winter weather. I'm with you, I like my stew in a bowl. Happy New Year. Another vote for the bowl! Thanks! Wishing you all the best in 2012. Bowl here too and I like to sop it up with cornbread....forget the spoon! This looks wonderful. I bought a chuck roast last night, planning to do a pulled roast with au jus. This looks so much better! I haven't made a beef stew in a couple years. I am going to make this next week. I guarantee that my husband will thank you. Thanks, Mary! Hope your husband enjoys it as much as mine did. Such simple basic ingredients, but they come together into something special in the stewpot! Wow I took a chance and maked this. It just looked so good in the picture. I am just waiting on the last ten min but so far the smell is wonderful and the sauce is so yummy. I can't wait to eat! Jean This is a great recipes. Thank you so much for sharing it. I will update on how it turned out. Definitely Delicious!!! I will be making this again. Thank you so much!!! My family truly enjoyed this. Melissa, thank you so much! I'm so glad my recipe turned out well for you and you liked it. Thank you for letting me know! I made this last week and it was a hit with my family. Thanks again for the great recipe. Mary, I'm so glad they liked it! 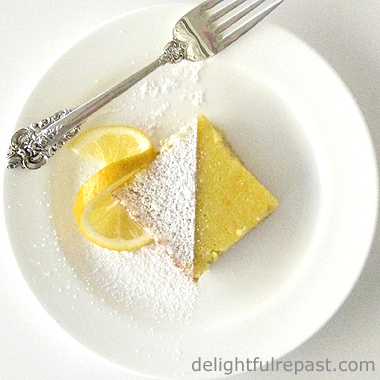 I wish I had some today, but I'm afraid my energy level calls for quick dishes this weekend! I started this dish yesterday so it would be at it's best for St. Patty's day tonight. I've tasted it and it's great. Can't wait to serve it. Oh, and I added a bottle of Guineess for the occasion! Cheers! I'm so glad you like it, Richard! I hope all you serve it to will as well. Guinness was just made for stews! Oh, bowl all the way! What is this "plate of stew"? Although honestly, it looks so good I might just eat it straight from the oven! Thanks, Anna! AND thanks for another vote for bowls instead of plates!